For families and individuals living paycheck-to-paycheck, saving money for the future, or for an emergency fund, might seem out of the question. But by developing a budget plan and sticking with it, it is possible to get ahead, assuming you are not currently drowning in debt. The secret, according to many financial advisers, is to take baby steps, cutting costs a little here and there, and then not spending the savings on other things. Here are five ideas that might help you carve out a little room in your budget. Food costs account for a huge part of spending each month, and unfortunately this spending isn't always subject to a budget. If you aren't tracking what you're spending at the supermarket each week, you're probably spending a lot more than you think. That's bad enough, but when you throw in a few meals at restaurants, then spending on food can quickly get out of control. Eating meals at home will save money, pure and simple. To maximize savings, plan meals before going to the supermarket. Use coupons and buy things on sale. Saving money on food will deliver the biggest bang for the buck when it comes to a household budget. Ever wondered how banks can afford to offer free checking and other services? Because most of their customers are paying for them. Don't be one of them. A monthly service charge on a checking account can easily be $10 a month. Out of network ATM fees can be $6 or more. Look for a bank or credit union that not only offers free checking, but will also pay you interest on your balance and reimburse ATM fees. If you keep your savings in your checking account, and have the discipline not to spend it, you can probably earn more interest than you would in a passbook savings accounts. And, for heaven's sake, don't use a credit card that charges an annual fee. There are plenty of credit cards with no fee and that pay some kind of cash back rewards. 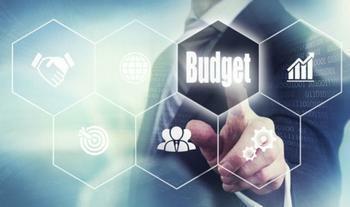 Most of us have fixed costs in our budget, but just how fixed are they? Your auto and homeowners' insurance premium may be the same amount each month, but these companies may be very willing to reduce your rate in order to keep you as a customer. Call them and tell them you have been shopping around and have found lower rates. Ask them what they can do. To save money, sometimes you only have to ask. The same is true for your cellphone provider. And while they might not lower your rate, you may be able to move into a less expensive plan. If you have a large credit card balance, it's probably taking a big bite out of your budget. You are also probably paying 15% or more in interest, making it harder to pay off. If you can transfer all or part of the balance to a credit card with a 0% introductory rate on balance transfers, you can save hundreds of dollars a year in interest. Just select a card that doesn't charge a high balance transfer fee. The Chase Slate card is one that doesn't. Finally, carry a small notebook with you for a week. Every time you spend any money, whether it's pocket change or a credit card purchase, write down what it was for and how much you spent. It's amazing, but at the end of seven days you'll have an eye-opening picture of your spending habits and where you might be able to cut back.